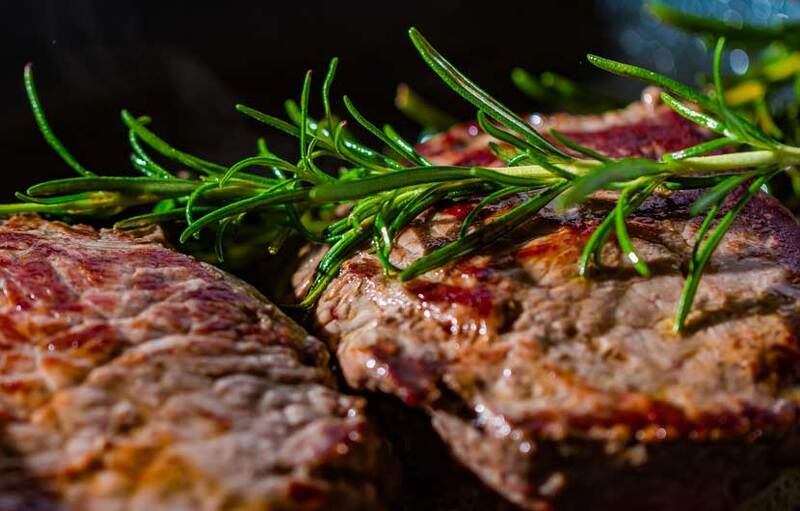 The gastronomy of Spain is as rich and varied as the country itself, with lots of first class ingredients to choose from, an excellence in cooking, wise old traditions and promoting new culinary concepts have led Spain to be at the top of culinary excellence in Europe. To define Spain in terms of food items is pretty easy, take some olives, extra virgin olive oil, fresh vegetables, sherry, wine, garlic, chicken, fresh fish, seafood and Iberian cured meats, and you are summing up the essence of the main gastronomic ingredients of Spain. When you arrive in Spain for the first time, hopefully you will want to explore the tastes on offer, remember, paella is not the only dish consumed and sangria not the only famous drink. Spanish cuisine is extremely diverse and ranges from snacks (tapas) to regional and local dishes. 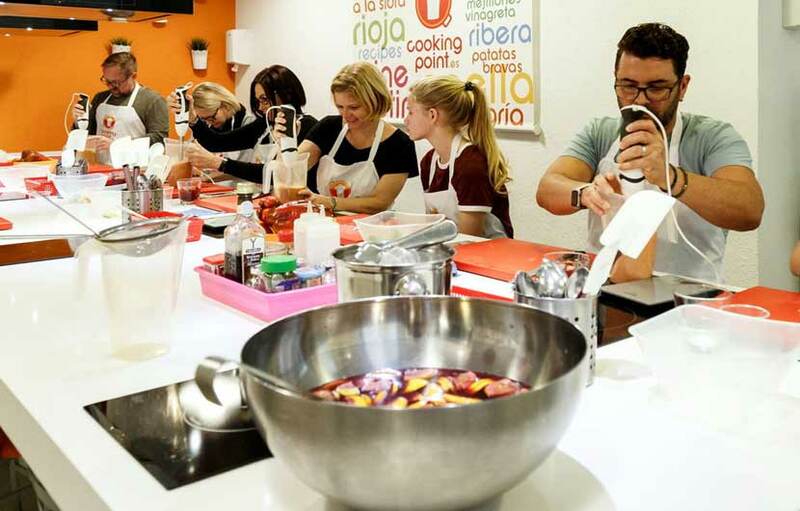 Each province offers their own take on what makes for a good meal and the variety of Spanish gastronomy is huge and delicious so be prepared to try everything and you will enjoy your holiday even more. A great way to explore the real Spain when eating out is seek out the sometimes smaller bars and hidden restaurants where the locals frequent. 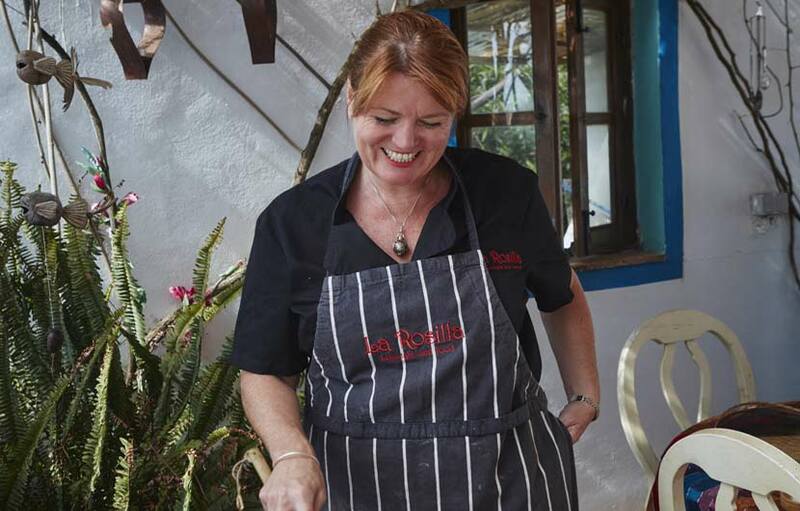 You are more likely to encounter authentic local dishes and lower prices whilst soaking up the unique atmosphere. Eating out in Spain is a real treat and generally very good value for money. A good option to discover the gastronomy of Spain and eating out during the day is the so called ‘’menu del dia’’ – menu of the day, which is usually displayed outside the restaurant or Bar, sometimes on a blackboard and will show the 2 or 3 courses, and drink, included in the menu. 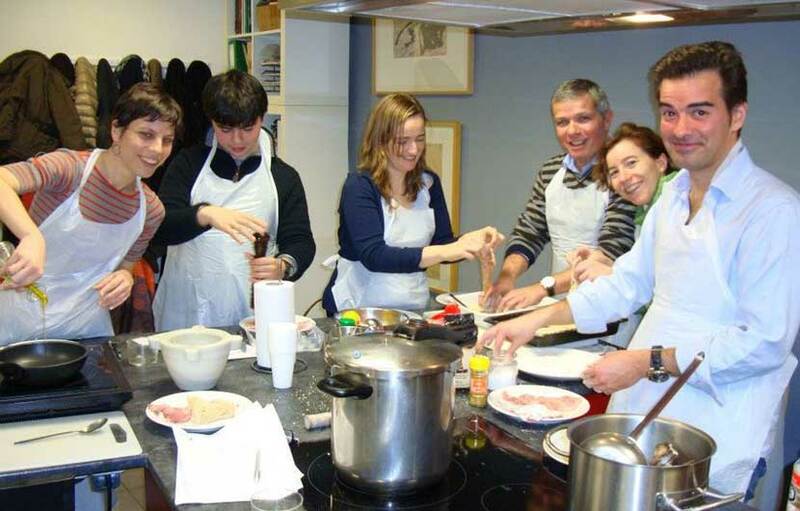 Prices range from 7 to 12 euro/person – the prices will vary depending on the category of the restaurant. It is a good idea to confirm before eating that “pan, postre y vino” (bread, dessert and wine – which are included in the menu), to ensure you do receive any unwelcome additions to the menu bill at the end of your lunch or diner. Spain is of course home of those famous Spanish tapas which are small plates of food served up in bars and restaurants all over the country and are usually very reasonably priced and a great way to try a number of Spanish dishes without having to order large dishes. The Tapa ( which means to cover ) was invented in a bar in Seville in southern Spain by farmers who used to cover their drink with a piece of bread to keep out the flies and other small insects. Gastronomy of Spain has been on a culinary high in recent years where some of the best restaurants anywhere in the world can be found, Barcelona alone boasts some 22 Michelin starred establishments. Three restaurants, the Cellar de Can Roca in Girona and the Mugaritz and Arzak in San Sebastian are often found in the top 10 in the world. The pick of the best 2 Michelin starred restaurants in Barcelona include Moments Restaurant, Abac, Lasarte and Enoteca, you will need to book well in advance though of having a chance to book a table at any time during the week. 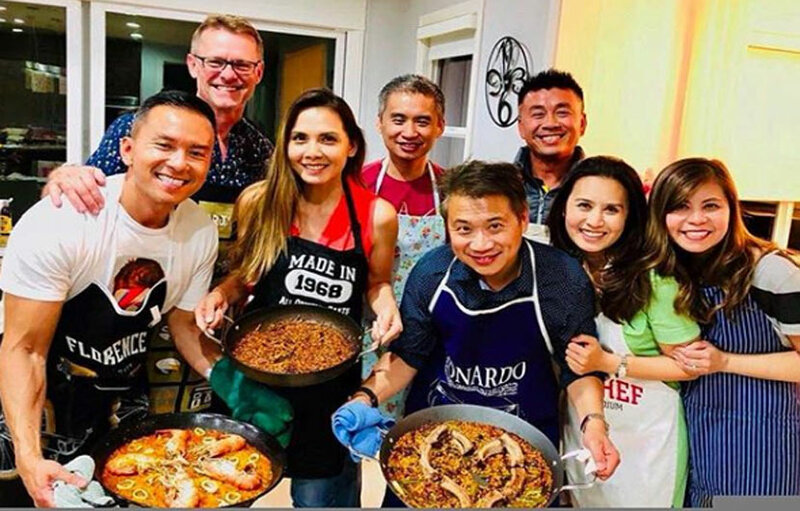 Paella is probably the most famous Spanish dish, known throughout the world and is a rice dish cooked in many different variation depending on the region. 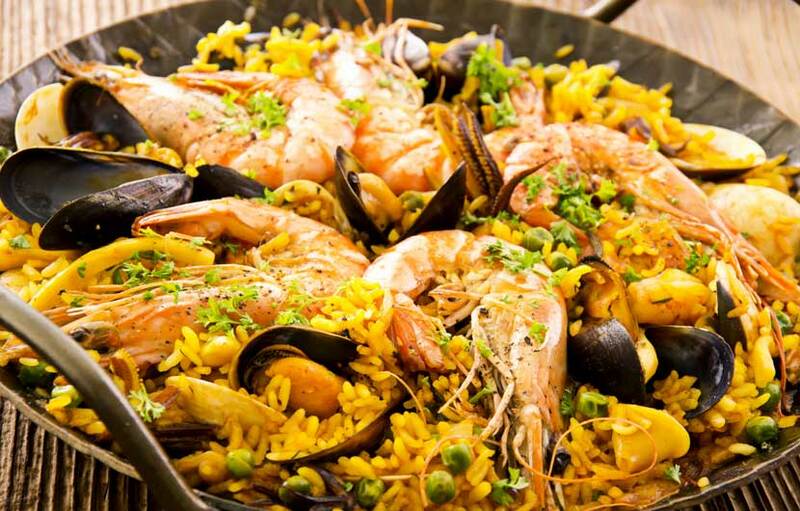 Usually Paella is cooked with seafood or chicken or rabbit and sometimes all at the same time. Where do you find the best paella? 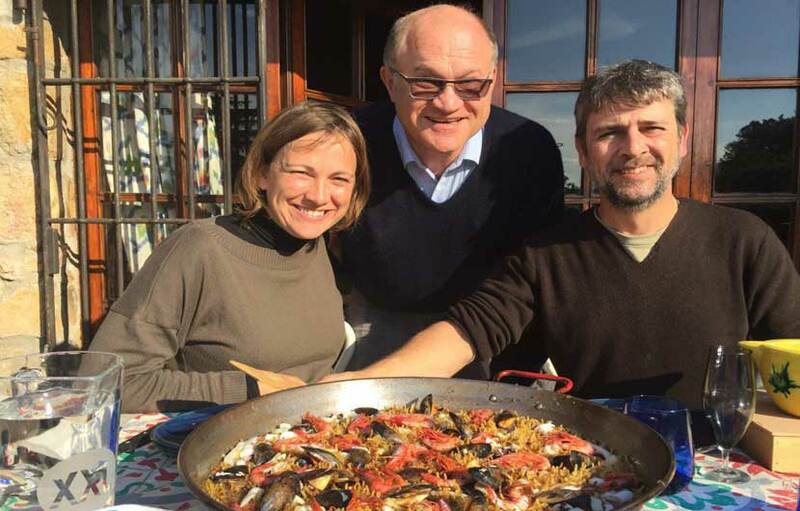 Well Valencia is the province where this famous dish was born, so arguably the best varieties can be tasted around this region. It is often a custom to cook huge Paellas during many of the festivals in Spain. 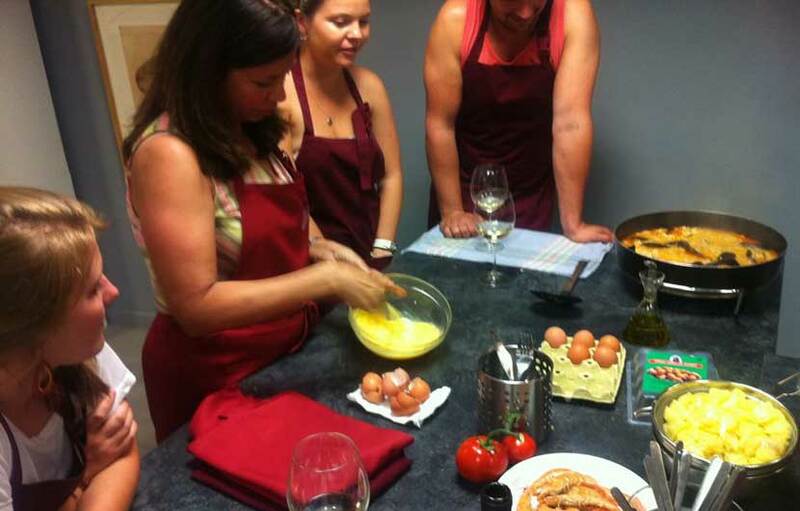 If you are into cooking there are plenty of opportunities to book into traditional cooking classes in Spain. Cold meats are a firm favourite in Spain. Cured ham tops the list and is a prize delicacy in Spain, known as "Jamon Serrano" or ‘’Jamon Iberico, it’s delicious to eat at any time of the day and you will soon get used to the unique taste. Ideally, good quality Spanish ham should be sweet rather than salty. One of the best types of Spanish ham is from the town of Jabugo in Huelva in Andalucia where the finest Pata Negra ( black foot ham ) is cured, surely one of the pinnacles of excellence of gastronomy in Spain. There are also several types of sausages made of pork meat, especially chorizo (spicy and thin) and salchichon (dry and very similar to Italian salami). Spain is a Mecca for fish and seafood lovers and on average a whopping eight kilos of seafood per person is consumed be each and every year. The choice is remarkable and what you would expect from a country surrounded by the Mediterranean and Atlantic seas. Lobsters, langostines, crabs, barnacles, shrimps, octopus. oysters, mussels and clams are amongst the favourites on offer all over Spain. There is always a good selection of fresh meats on sale at the larger supermarkets and indoor markets to be found in most towns and villages throughout Spain. Beef is eaten quite a lot in Spain and is called ternera. Other favourites include fillets of ternera, chuletas de cerdo ( pork chops ) lamb chops, chuletas de cordero. Galicia is well know for producing the best Spanish beef due its extensive are of green pastures and temperate climate. 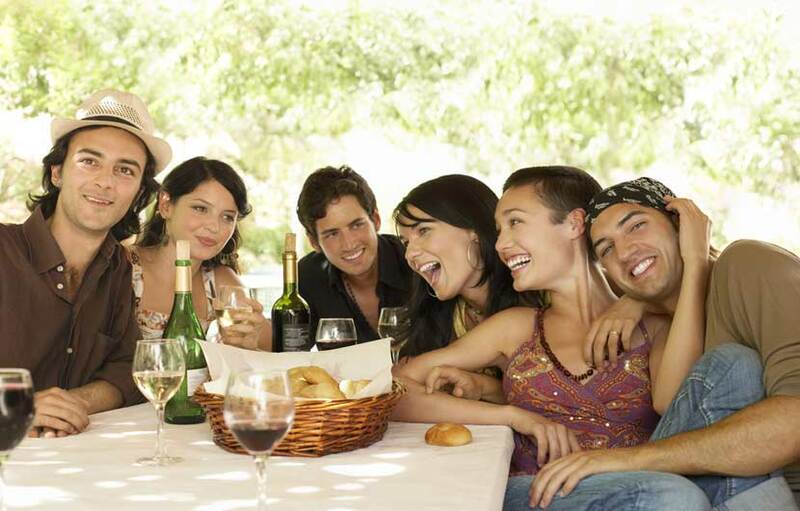 The wine in Spain is by excellence, the preferred Spanish drink when dining out. Along with France and Italy, Spain is one of the top producers in the world. It has a wide variety of quality wines from 57 different areas. Spanish Rioja is the king of wines and Sherry is the international wine of Spain, due to the increasing exports in recent years. 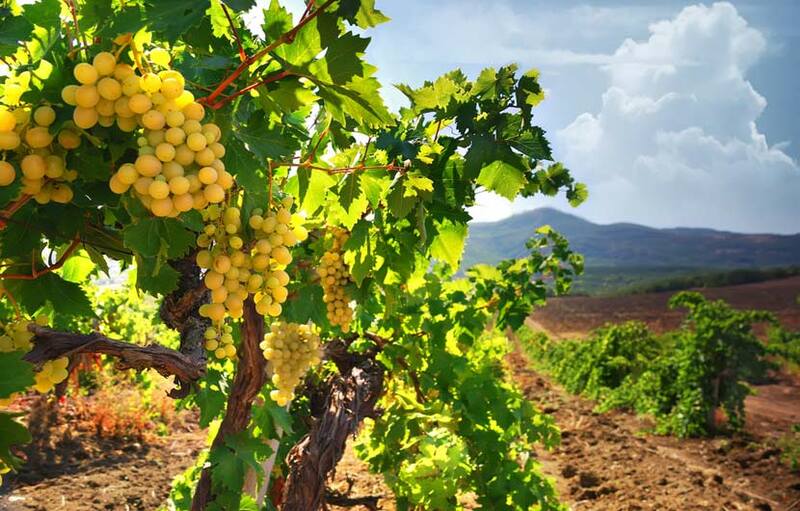 This world renowned wine whose name derived from Jerez, the reason being the first vines of this type were raised in the city of Jerez de la Frontera. Sherry (or Xerez) is available in various versions: dry fino, manzanilla very dry, semi-dry amontillado or Oloroso semi-sweet. White wine is “vino blanco”, red is “vino tinto”. Some of the most famous vineyards are found in Rioja, in the picturesque northern central area of Spain and at Penedes, near Barcelona. Sangria is known in Spain as a sort of punch prepared either with wine or champagne, mixed with pieces of fruit and sometimes with spirit drinks. Sangria is usually served in mugs with a kind of ladle, being very refreshing. 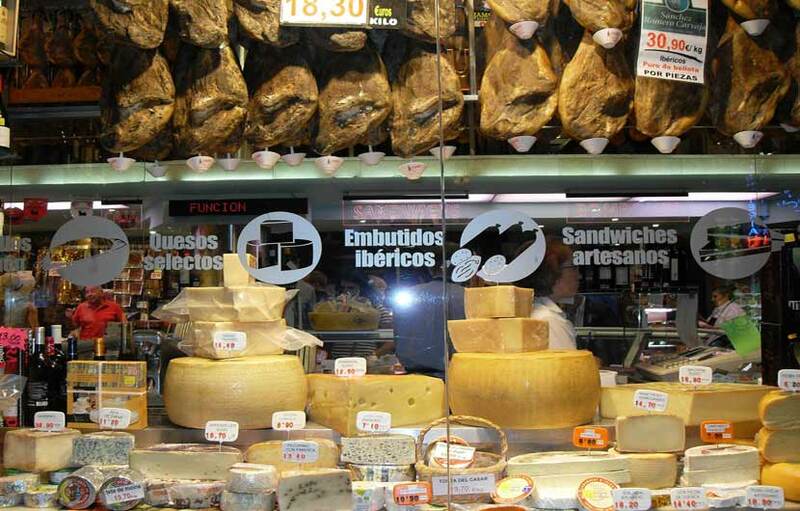 Spain is also home to some fine cheeses, there are around 100 different varieties. Every region has its own speciality, covering a full range of cheese types, from fresh to cured and fermented to blue-veined. One essential characteristic is the type of milk used in the production. Depending on the area, time of the year, climate, or tradition, cheese in Spain is made of cows milk, sheep’s or goats’ milk, or indeed a mixture of all three. Eating and drinking in Spain represents more than a necessity, it defines the country’s culinary traditions and customs, really delicious and one of the major attractions of the country is the opportunity to try out countless bars, cafeterias and restaurants, as a way to relax at dusk, after a tiring day at at work or after spending a day at the beach. 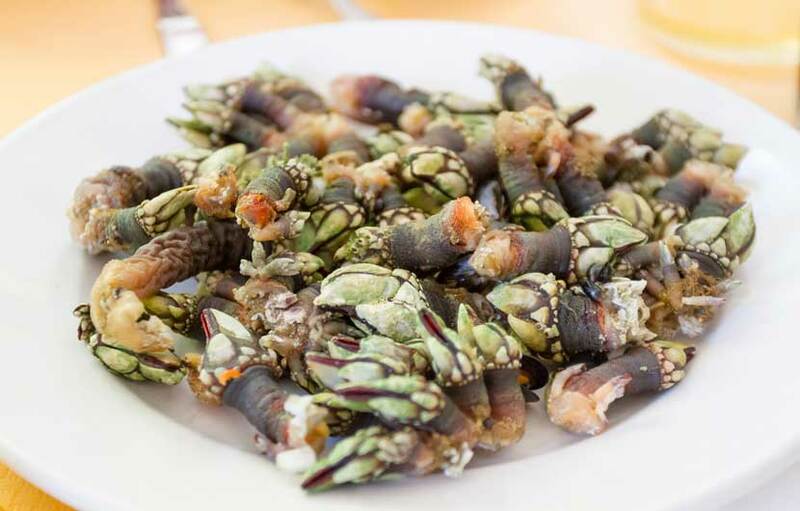 » Fresh fish and seafood – The king of gastronomy in Galicia is undoubtedly the fresh seafood that can be found in abundance on every corner of this green and fertile land. From spider crabs to cockles and lobster to small sweet mussels, you will never be far away from an eatery serving a selection of dishes containing fresh fish or seafood. » Vieiras a la gallega – Fresh scollps stuffed and baked in bread crumbs and paprika, a delicacy of some refinement. » Pimienta de padron – Very small locally grown peppers fried in extra virgin olive oil then sprinkled with sea salt. such a simple dish but packed with flavour. » Tarta de Santiago – Named after St James the saint of Spain. It is made up of ground almonds, decorated with fine caster sugar and the sword of St. James or a cross which covers the topping. It is thought a pilgrim may have introduced the recipe to Galicia during a pilgrimage. 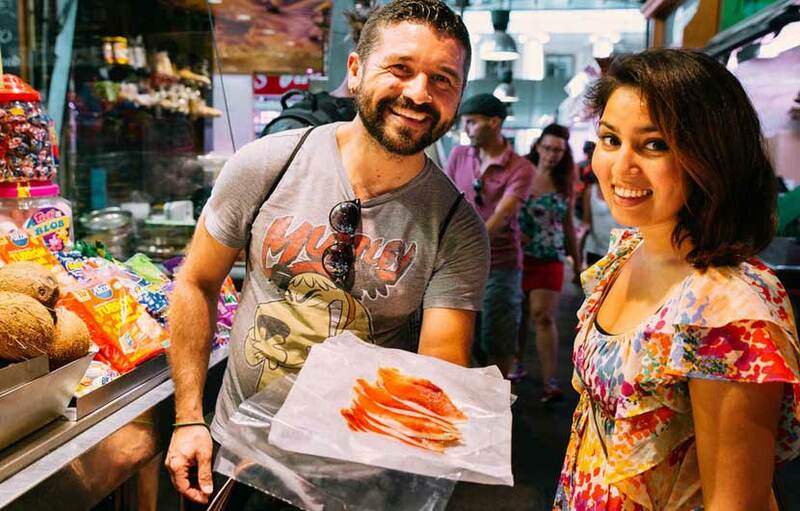 To continue your foody tour of Spain, through its fragrant culinary flavours, head to Catalonia, an excellent place to taste the culinary diversity. 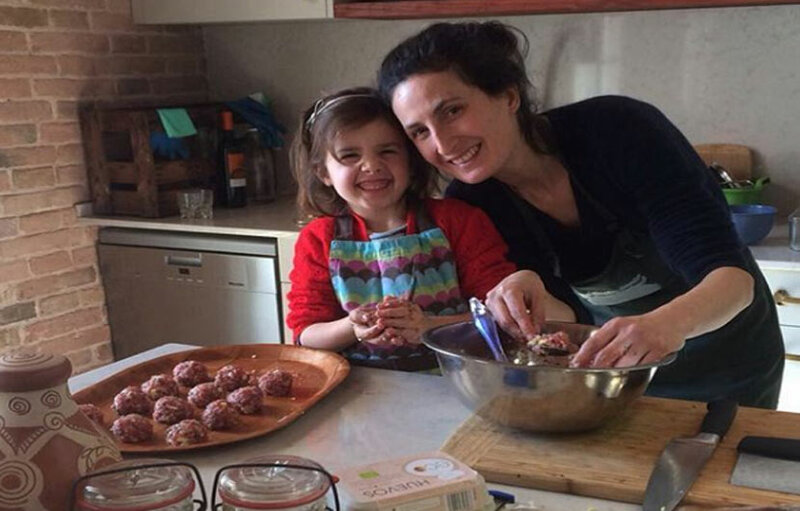 Catalonia receives influences from both the French Pyrenees in north and the Mediterranean breezes from the east, reason why the Catalan cuisine combines the mountain and coastal recipes in a wonderful way. Popular dishes include the best of both worlds, ‘’Mar i Muntanya’’, meaning “sea and mountain”, a combination of fresh meet alongside shrimp, garlic and almonds, all soaked in white wine sauce. Yum! Or for a true Catalonian dining experience, try the Escalivada – vegetables cooked in the embers of a wood fire, sprinkled abundantly with olive oil served with Cava – a sweet, sparkling drink similar to champagne only much cheaper. » Mar i Muntanya’’ meaning “sea and mountain”, a combination of fresh meet alongside shrimp, garlic and almonds, all soaked in white wine sauce. » Escalivada – vegetables cooked in the embers of a wood fire, sprinkled abundantly with olive oil served with Cava – a sweet, sparkling drink similar to champagne only much cheaper. » Pan con tomate – a hugely popular dish simple to prepare. A slice of fresh farmhouse bread or baguette cut in half, toasted, rub a fresh tomato into the bread, drizzle with extra virgin olive oil and some sea salt. Such a simple but tasty dish, also goes well with slivers of finely cut Iberian ham. » Sofrito – A tasty tomato suace using tomatoes, garlic, onions and peppers. Goes well was a side on many dishes. » Crema Catalan – a very addictive Catalan dessert. An egg custard finished with caramelised sugar which leaves a fine sweet crunchy topping to the dessert. 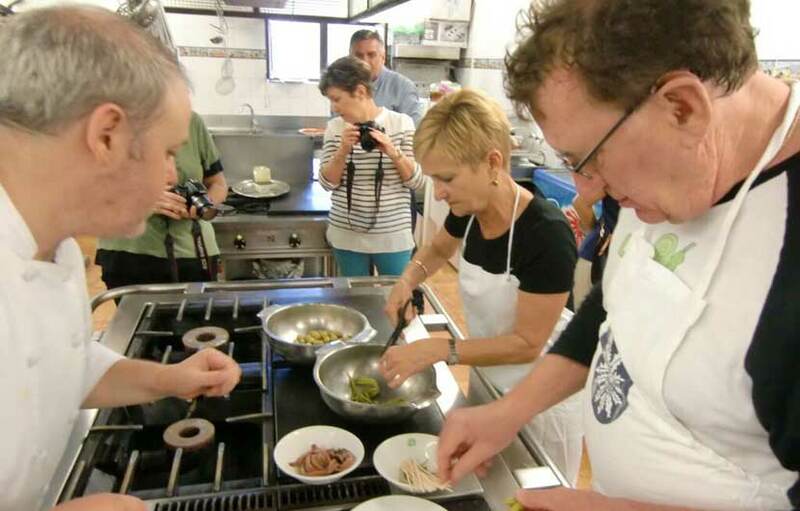 They say that any tour of Spain, especially a culinary one, should include a visit to the sunny and charming Andalucia! The emblematic tapas tradition originated in Andalucia, eaten with a glass of your favourite beer. Andalusia’s specific confectionery, with Moorish inspiration and adopted by the Christian Monasteries, is based on honey and walnuts and fits perfectly over the salty Jamón Ibérico (Iberian ham), or over Boquerones (fresh anchovies). 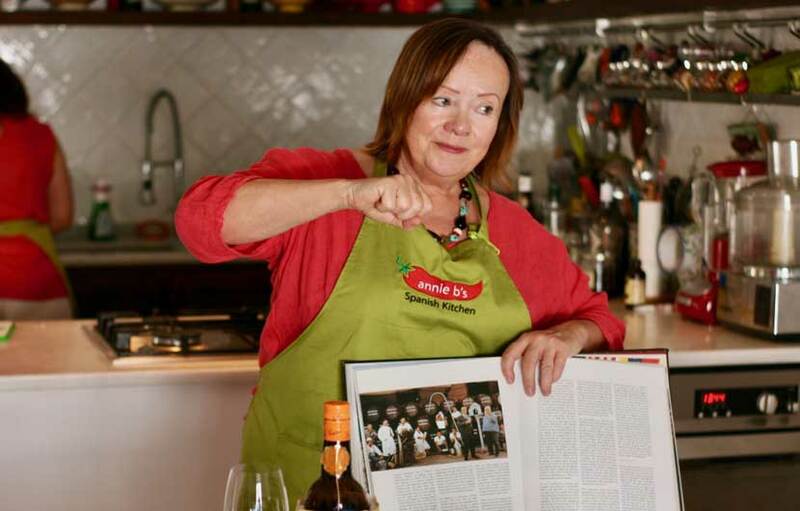 Of course, serve them with Jerez, a brandy produced only in this part of the region of “The Sherry Triangle” around Jerez. 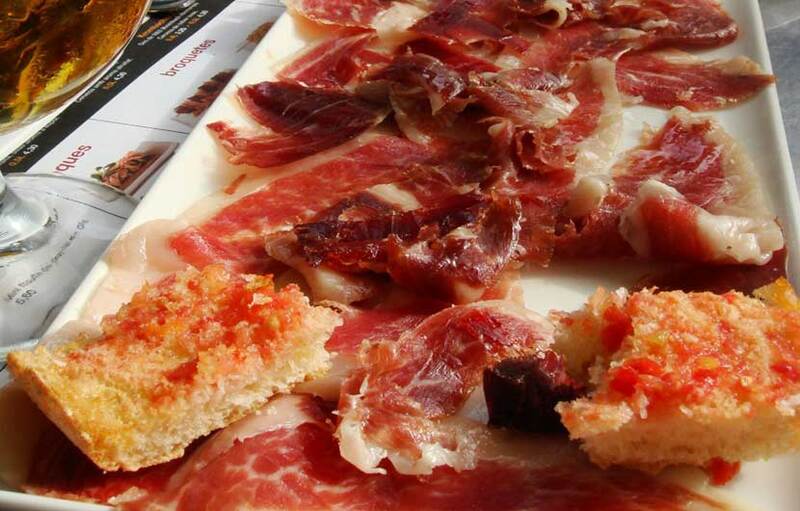 » Jamon Iberico – Some of the best cured ham is from Andalucia. 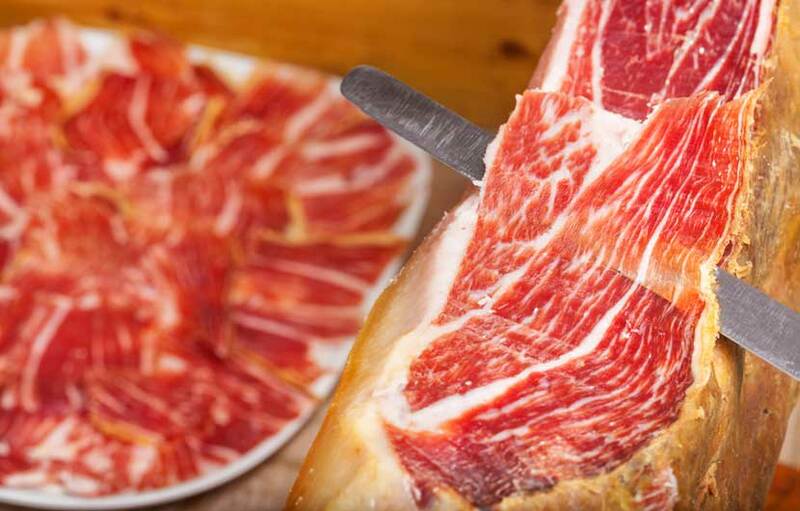 Jabugo is one area in Andalucia where cured ham excels in its taste and quality. Cut off the bone in very fine small strips and usually eaten with small crunchy bread sticks. » Extra virgin olive oil – Spain is one of the worlds biggest producers of olive oil, the province of Jaen alone boasts over 150 million olive trees. » Pescaito Frito – Very popular in Malaga and along the coastal areas of Andalucia. Fresh locally caught fish deep fried in olive olive, the most popular fish eaten are boquerones, baby squid, hake, shrimp, squid rings and octopus. 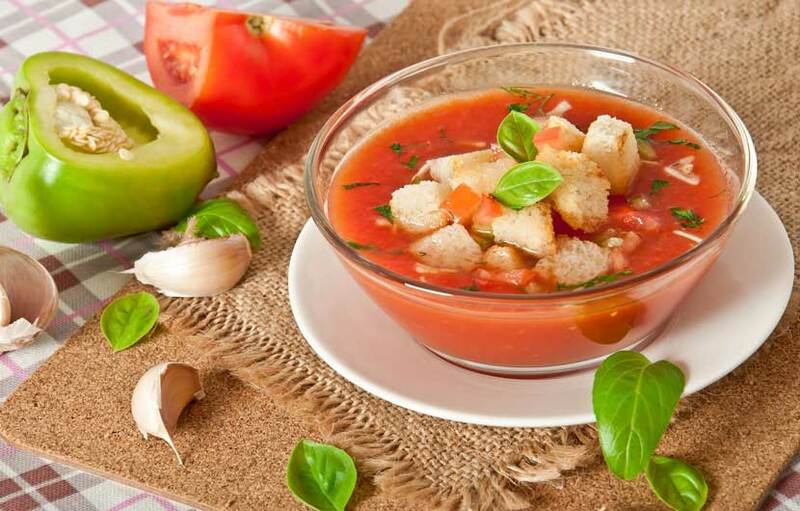 » Gaspacho Andaluz – A refreshing cold soup made from fresh tomatoes, cucumber, peppers, garlic, olive oil, breadcrumbs and sea salt all blended together. » Salmorejo – This is a deliciously thicker version of Gazpacho. Using essentially the same ingredients but with more bread to thicken the dish, usually served with chopped cured ham and diced boiled egg on the top with a drizzle of extra virgin olive oil. Many holiday makers visit this part of Spain each year and enjoy the culinary dishes on offer, flooded in freshness and flavour. The “Eternal Spring” in the Canary Islands, opens your appetite to a semi tropical diet that easily is distinguished from other menus on the continent, by its native Guanche and African influences, but also by the food brought from America, in the era of discoveries. Gofio (roasted corn) is the preferred ingredient in all dishes and the spicy sauces Mojos amplify your appetite when is served with a portion of sanchocho canario (salted white fish) and papas arrugadas (small potatoes boiled in seawater). » Papas Arrugadas – Wrinkled potatoes. 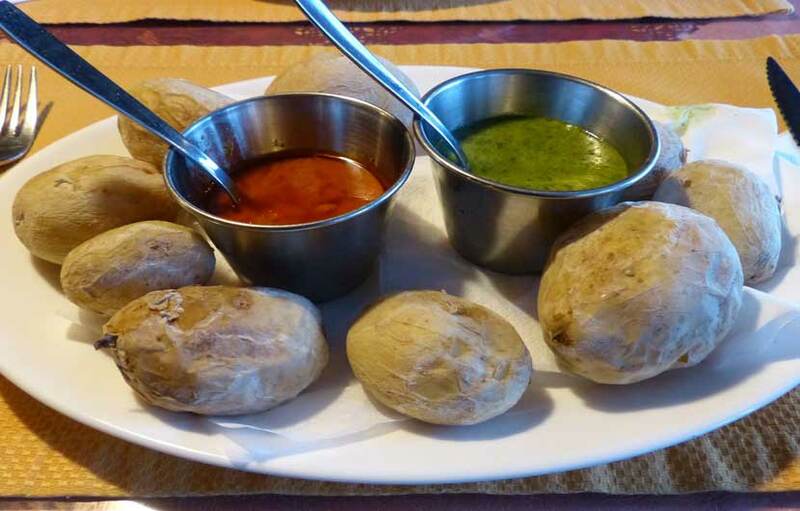 Small whole unpeeled potatoes cooked in water and lots of sea salt served with a spicy Mojo sauce. » Mojo Picon – Spicy sauce made from garlic, paprika, chillies, sea salt, cumin seeds, white wine vinegar and olive oil. Goes great with Patatas Arrugadas. » Caldereta – A tasty lamb stew made with local lamb or goat, garlic, chillies, cinnamon, pepper corns, tomatoes, vinegar, red peppers and green olives. » Bienmesaba – A rich dessert made with honey, almond cream, eggs and rum.